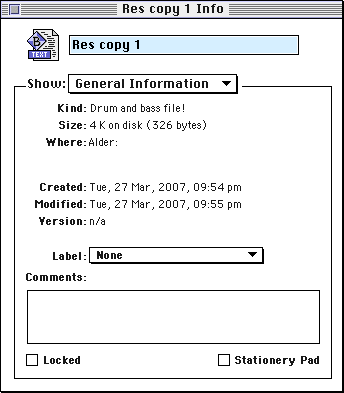 A ‘kind’ resource in Mac OS 9 and earlier is a definition table of file type names, such as JPEG image instead of a default such as GraphicConverter document . 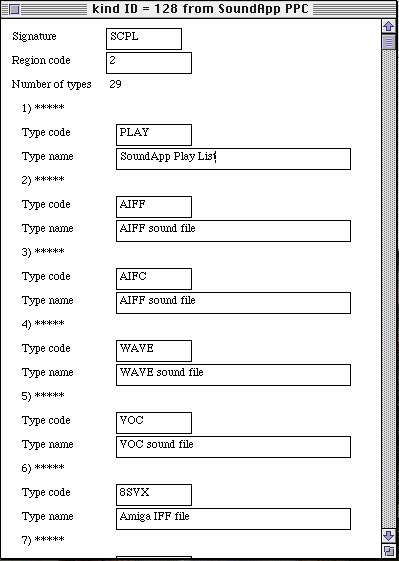 It specifies all the names for the file types associated with your application’s signature. 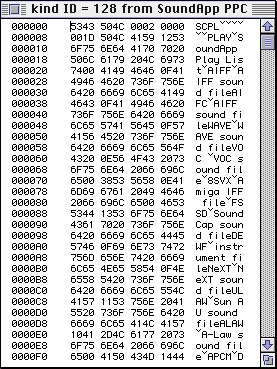 It is a sibling resource to ‘BNDL’, which provides the icons for the file types. 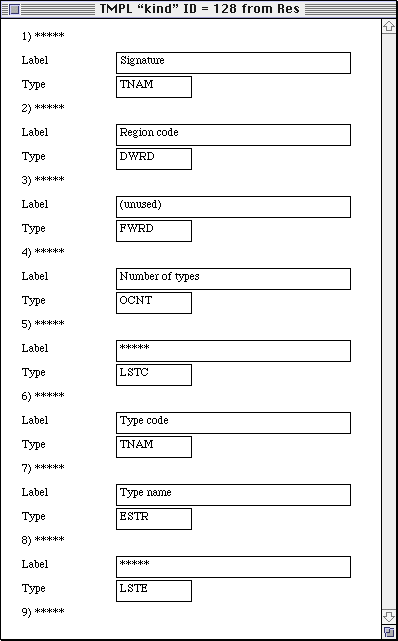 A ‘kind’ resource contains an application signature, a region code, and a table of file type codes and associated names. The region code specifies which region should utilise the table; all other Mac OS localisations will ignore it. Typically, applications whose language is English – generally originating from the United States – set the region code to 0 (United States). This means that having owned a Macintosh since 1997 or 1998, it has taken me nearly ten years to discover that the Macintosh prior to X – after all – allows custom file type names as seen in Microsoft Windows. When all my images showed up as GraphicConverter document and my music as SoundApp PPC document , I truly believed that this was all the Macintosh was capable of, instead of proper file type names such as Portable Network Graphics image and Scream Tracker 3 song as you are permitted in Windows. On one instance, I did see a custom file type name, but failed to discover how it had been done, and assumed that most developers never bothered. Having just accidentally discovered the ‘kind’ (on 27th March 2007), I suddenly realised just how many applications shipped with one. The fatal flaw is in Apple’s concept of localisation. Apple did not provide localisation inheritance, so there is no generic English region. Since most Macintosh software originates from the United States, most ‘kind’ resources contain a region code of zero. Thus, these resources are ignored in all other English-speaking nations, including Britain, Australia and New Zealand. New Zealand and Canada do not even have region codes! (There is one for Canadian French, but that is a little different.) Norway is code 12, but the Inside Macintosh region codes list even omits Norway, which has at least two languages. 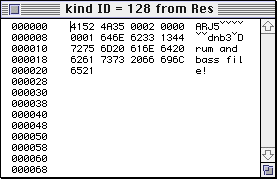 I have used both manual hex editing, and now my own template, to reset various applications’ ‘kind’ resources to Britain’s region code and reinitialised them via Save a BNDL, allowing me to gain all the nice file type names without even a reboot. I also created a ‘kind’ resource for PictureViewer with my most common file types in, which suprisingly lacked one altogether. There is a ‘kind’ template available somewhere. Reportedly, MacLinkPlus contains one. However, I have been given a vast assortment of templates and other ResEdit add-ons and there isn’t one in there. So I created one. Much easier than I realised. 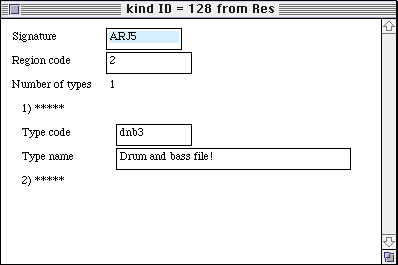 Simply copy the ‘TMPL’ resource “kind” from ‘kind’ template into your ResEdit preferences and reload ResEdit. You can experiment with the template by opening an application’s kind resource while the “‘kind’ template” file is open in memory: ResEdit is aware of the template during this process and will make use of it. I built my template using the Inside Macintosh: Translation Manager documentation, and a little help from an existing ‘kind’ resource to help me past a small deficiency in the specification.